Screen 1: New buses and tracks can be added from the Mixer Setup dialogue. Samplitude Pro X2’s aux buses, submix buses and VCAs add up to a powerful and flexible routing system. Like most DAWs, Samplitude has other track types besides standard audio and instrument tracks. In fact, there are three other track/channel types: aux buses, submix buses and VCA fader channels. You can add aux or submix buses (and indeed audio and instrument tracks) to the mixer by clicking on the Setup button at the top right-hand corner of the mixer. Click the ‘+’ or type a number in the text field to specify how many buses you want to add (Screen 1 above). These will then be appended to the mixer and the arrange page (VIP). This configuration can be saved as a preset, or you can load existing presets. There are other settings in this window, too, but I will discuss those in another article. Aux buses are used to host your send-effect plug-ins. By default, each aux bus strip has 10 visible plug-in slots, but can be toggled to show just four of them by clicking the ‘-’ or ‘+’ at the top left. They can also be hidden or revealed by clicking the adjacent arrow at the far left of the mixer. Even if you manage to fill up all 10 slots, you can keep adding plug-ins indefinitely, but to view or edit plug-ins beyond the 10th one you will need to right-click on the top header marked Plug-Ins to open the Plug-in Manager. All audio and instrument tracks have dedicated effects sends which can send simultaneously to multiple aux buses. For example, you could have one aux bus set up with a reverb plug-in, another with a delay plug-in and a third with some sort of modulation effect. One would then use the horizontal aux bus faders located below the gain control on the track channel strip to adjust the send levels to each aux bus. It’s also worth noting that if you have no aux buses in the project, as soon as you move an aux bus fader, Samplitude will automatically add an aux bus to the project. If you move the first aux bus fader, a new track/channel named ‘AUX 1’ will be created; if you move the second aux bus fader, a track named ‘AUX 2’ will appear, and so on. Screen 2: Routing a track to a submix bus is a simple matter of reassigning its output in the mixer. Submix buses are, as the name suggests, used to combine a group of tracks. 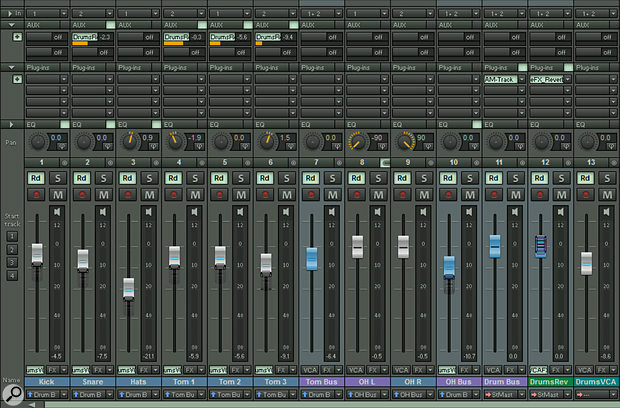 For example, you might want to route all your keyboard tracks to a submix bus, which would give you control of the overall levels of all the keyboard tracks from one fader, with the added advantage of being able to add effects to the submix insert slots that will affect all the tracks routed to this bus. Once you’ve added a new submix bus you can quickly route the tracks you want to the bus by left-clicking on the track header number of the first track, then Shift-clicking on the last track you want to add. All tracks in between will be selected and highlighted. (You can also Ctrl-click to add non-contiguous tracks to the selection.) Now go to the bottom of any of the selected channel strips where it says ‘StMast’ and click on the downward arrow. Select the target bus from the list, and all selected tracks will be routed to that bus (Screen 2). You can position buses anywhere you choose in the mixer: simply click and hold the number header at the top of the fader section and drag left or right. All mixer track types can be moved in this method. 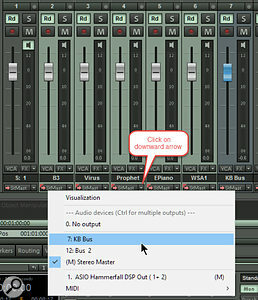 Submix buses can also be nested; for example, you may want to route your electric guitar rhythm tracks to Bus 1 and your acoustic guitar rhythm tracks to Bus 2, then create a third bus named ‘Gtr Mix’ which will take the combined output of your electric and acoustic guitar buses, giving you overall control of the levels of all the guitars, and a place to add further overall processing to them. VCA faders were introduced from Magix’s high-end Sequoia DAW to Samplitude in Pro X2. VCA stands for ‘voltage controlled amplifier’ and these have been prevalent in upmarket hardware consoles for many years. At first glance, they appear similar in concept to submix buses, but there are important differences. The most significant difference is that no audio passes through a VCA fader — so, although you’ll see inserts and aux sends on VCA channels, they don’t do anything to the tracks that are being controlled. All that a VCA fader does, in effect, is allow you to adjust the levels of multiple channel faders simultaneously. Assigning a VCA fader to all the drum channels in your mix does the same as grabbing all of their individual faders at once. One consequence of this is that as you turn down a VCA fader, you also turn down the level of any post-fade sends on tracks assigned to that VCA group — so, for instance, if you fade down all the drums with a VCA fader, the snare reverb fades down too, whereas using a submix bus to do the same thing will leave the snare’s reverb send all the way up. One obvious application of VCAs is that you can use them to quickly lower the overall volume of the source tracks if the levels are getting a bit hot, as sometimes happens. 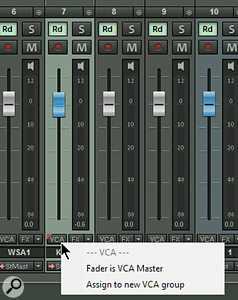 Screen 3: Almost any fader within the Samplitude mixer can act as a VCA master, or be assigned to a VCA group. By adding tracks and buses to a VCA group, you can quickly use the VCA fader to adjust the levels of the source tracks. Here’s how you do it. Just below the fader strip in the Samplitude mixer, you will notice a button on the left marked VCA (Screen 3). 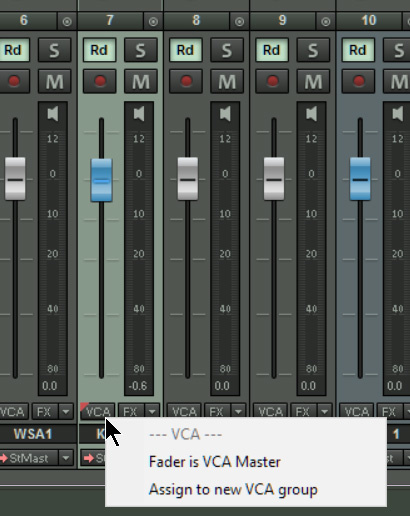 If you click on this button you will see a pop-up menu showing two possibilities: ‘Fader is VCA master’ and ‘Assign to new VCA group’. Suppose we want to assign the drum tracks and buses to a new VCA group. First, we need to select the source tracks using the same selection routine outlined earlier. Then, left-click on any of the VCA buttons of the selected tracks and choose ‘Assign to new VCA group’. A new fader called ‘VCA 1’ will be created at the far right of the mixer. Double-clicking in the text field allows this to be renamed to ‘Drum VCA’ or to whatever your preferred naming scheme is. Now try adjusting the VCA fader and you’ll notice something magical happens. As you pull the fader down, the original solid caps remain visible, but a secondary ‘ghost’ fader cap appears, showing the current levels relative to the VCA master fader. You can still adjust the levels of the individual track faders, and the ghost version of that fader will adjust accordingly. To remove tracks or buses from a VCA group, just click on the source VCA button and deselect the enabled VCA option. Samplitude VCAs have a fairly straightforward feature set and experimentation is the key. 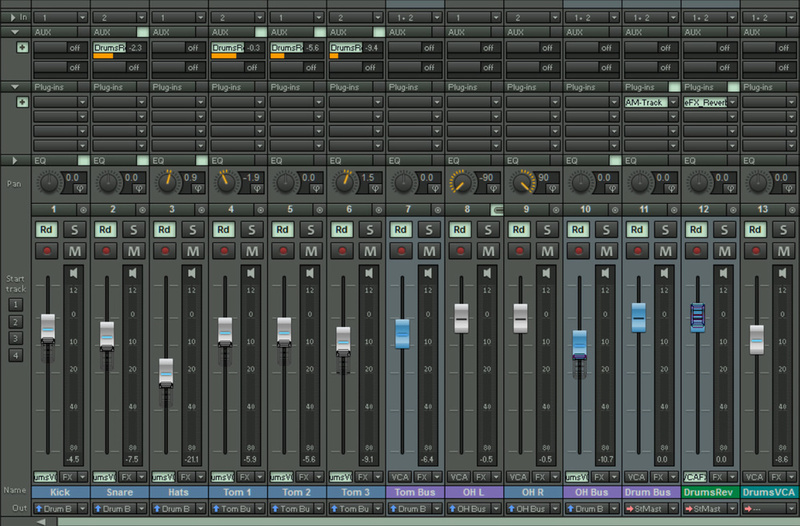 Screen 4: an example of how you might use submix buses and VCA faders with a multitrack drum recording. Adjust the level of all drum tracks individually, and of the overheads as a stereo group (OH Bus). Control the overall level of the toms while retaining the possibility of treating them individually (Tom Bus). Control the overall volume of the whole drum kit and drum reverb simultaneously (VCA drum group). Control the overall volume of the whole drum kit independently of the drum reverb (Drum Bus). Control the overall volume of the reverb (Drum Rev) independently from the overall drum volume (Drum Bus). The combination of aux, submix bus and VCA channels thus opens up many possibilities just for drums — imagine what a powerful combination this can become if you use all the options on different instrument groups, vocal groups and even the complete mix!